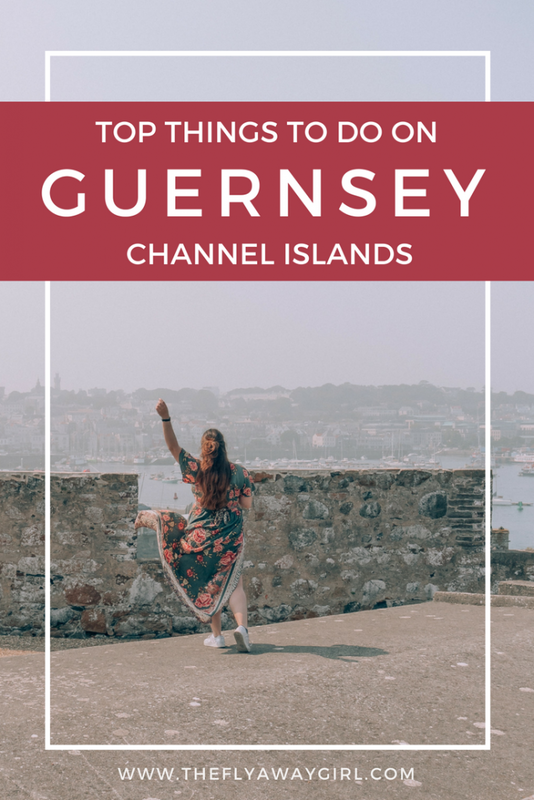 The wonderful island of Guernsey – not part of the United Kingdom (but still the British Isles), closer to France than the UK and recently made much more well-known thanks to the novel The Guernsey Literary and Potato Peel Society! 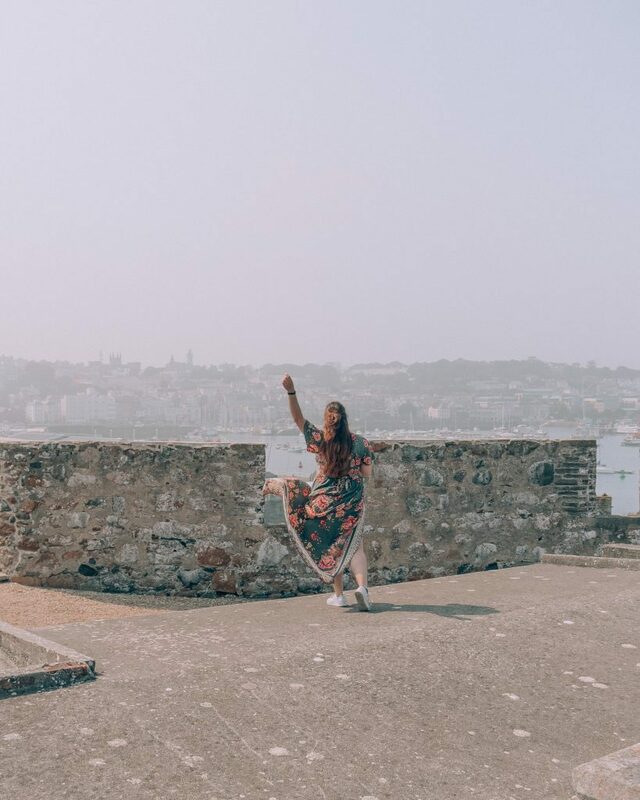 With Condor Ferries you can travel to the beautiful island of Guernsey in less than three hours – perfect for exploring the island by foot or by car. If you are looking for a perfect Guernsey day trip itinerary, then look no further! Disclaimer: I recently travelled to Guernsey in collaboration with Condor Ferries. 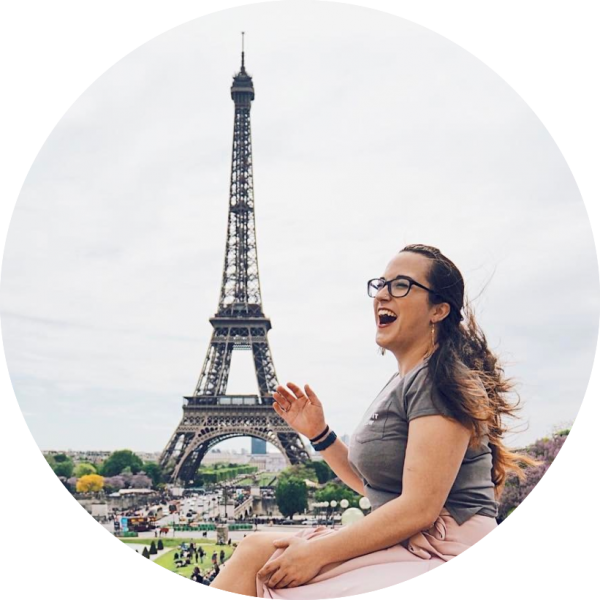 This post may also contain some affiliate links which keep me supplied with coffee so I can keep writing. As always, all opinions are my own. If arriving in Poole by train, you can get a taxi from the station to the ferry terminal (10 minutes and costs around £6-7) or by bus with routeONE or the number 8, although they both include around 10-15 minutes walking. If you’re feeling energetic, it’s a 22-minute walk from the station to the ferry terminal. Download Uber and get £3 off your first journey! If you want a bit more relaxation on the ferry journey (or, like me, wanted to nap), upgrade to Ocean Plus to get super comfy reclining seats. It’s in a separate area from the rest of the ship with entry by code, plus there are a bar and café accessible to only people with Ocean Plus. If you really want to push the boat out (pun intended), upgrade to Ocean Club, which includes complimentary tea and coffee, as well as luxury leather reclining seats and steward service if you get peckish. A few basics before the full Guernsey day trip itinerary! First off, the main language in Guernsey is English and the currency is both the Guernsey Pound and pound sterling (GBP), but remember to use all your Guernsey pounds before you get back to the mainland as you can only use them in the Channel Islands! Guernsey is the second largest of the Channel Islands after Jersey, and the capital is the beautiful town of St Peter Port, located on the eastern coast of the island and also where the ferry port is. Now, let’s get on with the itinerary! After you disembark from your ferry at St Peter Port, wander along the promenade until you reach Tea & Co. With a huge selection of different teas as well as great coffee and cakes, it’s the perfect spot for a midmorning snack before you head out to explore more of Guernsey! After enjoying a coffee and a slice of cake, continue your wander into the town of St Peter Port. 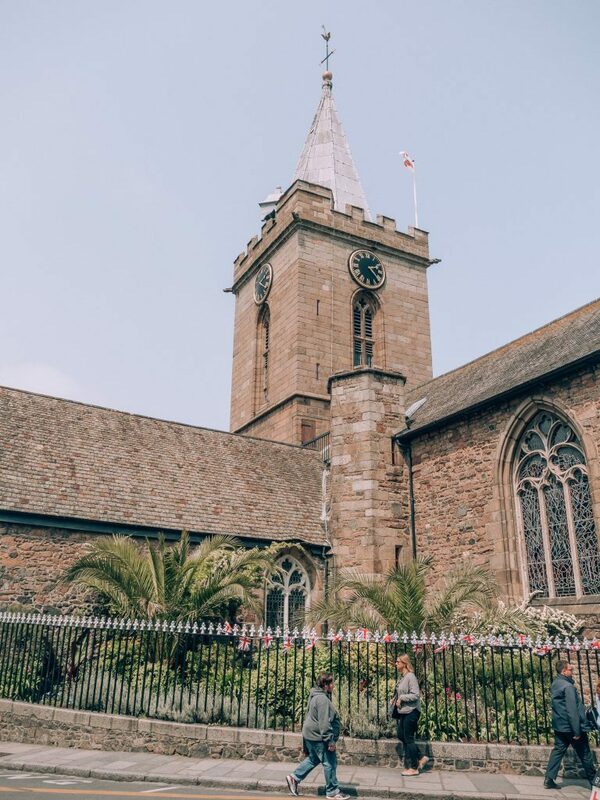 Take a walk through the shopping streets and visit the Town Church (full name: Parish Church of St Peter Port), which dates back to the 11th century. It’s also in the Guinness Book of Records as the closest church to a pub (a huge distance of 18 inches), so there’s also that. If I had planned my trip to Guernsey better, I would have taken a bus to L’Ancresse earlier in the day as I didn’t time it so well and ended up running out of time! Therefore I would recommend taking a bus there early on in the day if you want to get a spot of beach time. Considered one of the most beautiful beaches on Guernsey (the barista at Tea & Co told me he feels it’s the most beautiful), it has a white sand beach and the water is perfect for swimming and paddling. If you are in Guernsey for longer than just one day, considering spending more time at L’Ancresse Bay and also visit nearby Pembroke Bay. You can also go windsurfing, surfing, sailing or kayaking at both bays and visit the kiosk at L’Ancresse for a bite to eat. You can get to L’Ancresse from St Peter Port by bus 11, 12 or 92 from Town Terminus (Stand C). One place not to be missed when on a Guernsey day trip is the beautiful Castle Cornet. It’s an island castle, built on what was formerly a tidal island (previously the causeway connecting the island and the main island of Guernsey would have been submerged at high tide). Dating back to the early 13th century, the castle has been important throughout many periods of history. Entrance to the castle is £10.50 for adults and only £3 if you are a student, and includes entry to all the castle’s museums. 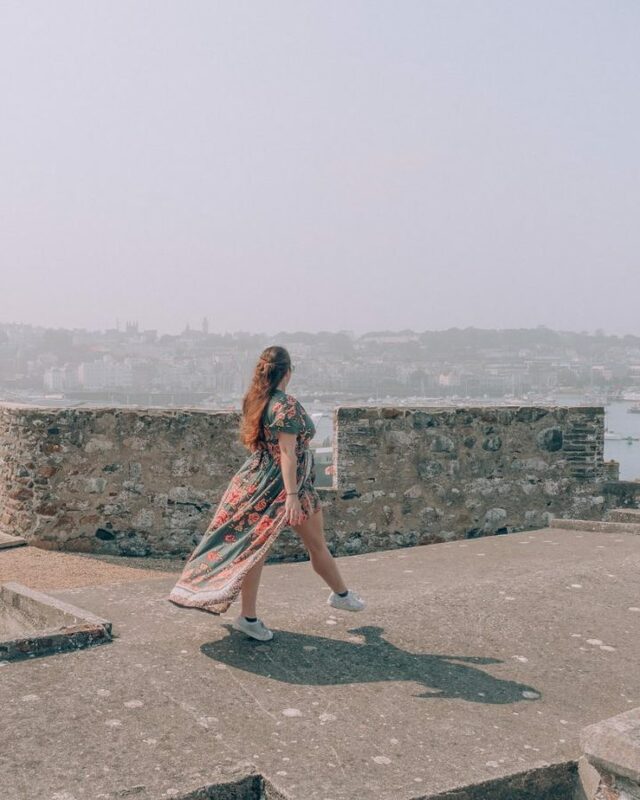 I only had time to see the main museum called the Story of Castle Cornet, but if you do only have time to see one museum I highly recommend it! It recounts the history of the castle through the ages, from the castle’s construction when the island was part of the Kingdom of England, throughout the 14th-century occupation by the French, during all three English Civil Wars (Guernsey was, in fact, Parliamentarian, while the castle supported the Royalist cause) where for nine years the castle was on the other side from the rest of the island, and then it covers the periods through the Napoleonic Wars up until present day, including both world wars. Interested in reading possibly the most popular book about the island of Guernsey? Get yourself a copy of The Guernsey Literary and Potato Peel Society today – believe me, you will read it cover to cover in no time! For me, the World War II history of Guernsey is particularly interesting as the Channel Islands were the only part of the British Isles that were ever occupied by the Nazis. German troops occupied Guernsey from 30th June 1940 until Liberation Day on the 9th May 1945. The majority of Guernsey children were evacuated to live in England and sadly the occupying German troops deported over 1,000 Guernsey residents to concentration camps in Germany. During this period, Castle Cornet was used by the Germans as a prison and they referred to it as ‘Hafenschloss‘, or harbour/port castle. Once you are exhausted from all the historical information, don’t forget to explore all of the castle. It is an amazing spot for some photo opportunities, as well as some beautiful views over St Peter Port and the harbour. Cafe Emilia is a beautiful cafe in St Peter Port with a Portuguese twist. I had a delicious jacket potato, as well as a soy latte (they serve Bean14 coffee, a roastery based in Guernsey that even has its own plantation) and a yummy pastel de nata. The cafe is a perfect spot for a late lunch before you head back to the port to get the ferry back to Poole! Time to go back to the ferry! Don’t forget to check out the Liberation Monument before you embark on your return voyage – it’s on St Julian’s Pier just before you get to the ferry port. The Liberation Monument was erected on the 50th anniversary of Guernsey’s liberation from the occupying German forces. 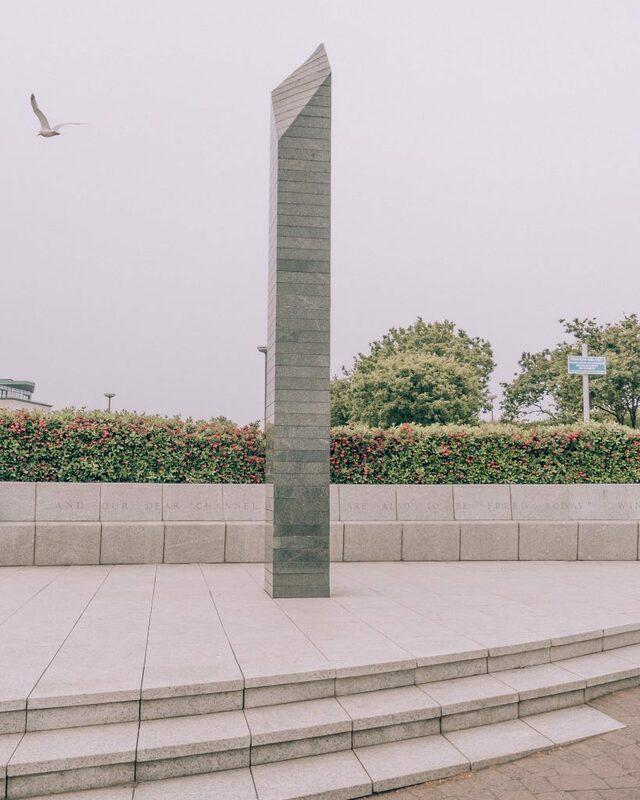 The monument, which is in the shape of an obelisk, is actually made up of 50 layers of Guernsey granite which represents the 50 years of freedom and the slanted top – which cuts through five layers – represents the trauma during the five years of occupation. And the day is almost over and your Guernsey day trip is almost at an end, so it’s time to be back on your ferry to head back to Poole. Don’t forget to do a spot of duty-free shopping, maybe grab a bite to eat or something to drink, or read a book (maybe your new copy of the Guernsey Literary and Potato Peel Society…) or have a nap. Yes, I did the latter. 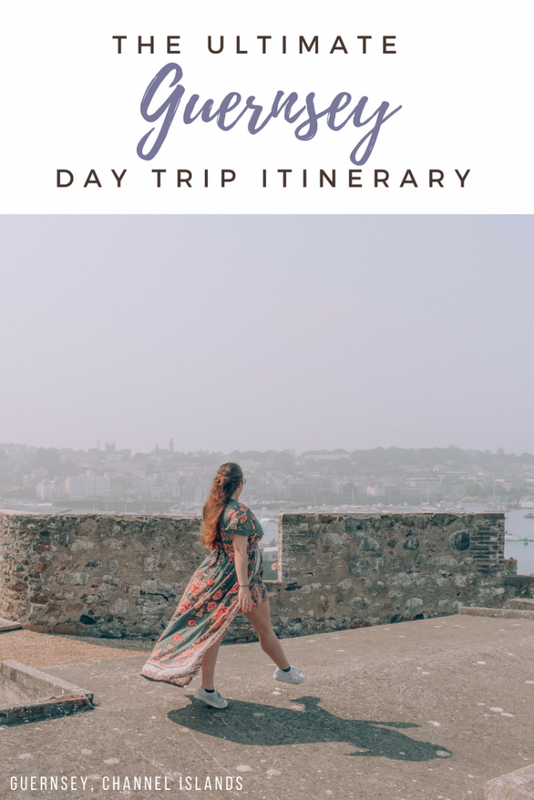 I hope you now feel more prepared for a Guernsey day trip after reading all about mine and my suggestions for you! 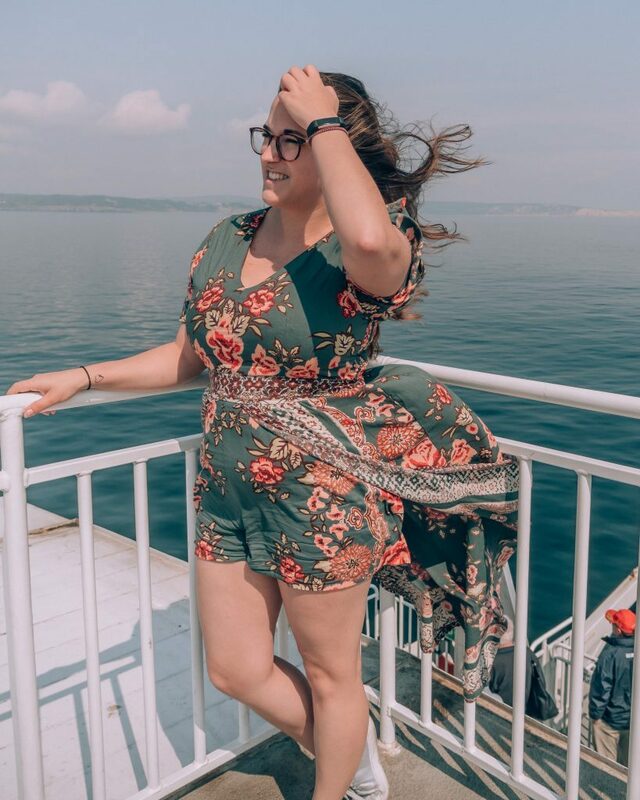 Let me know in the comments if you go on a trip to Guernsey or if you have any other recommendations for when on the island!